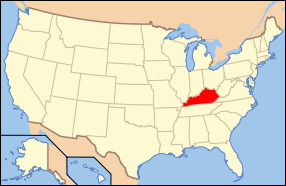 Kentucky is located in the eastern central region of the U.S. And is one of four states that are constituted as a commonwealth. The state was actually originally a part of Virginia, but in 1792 it became the 15th state admitted to the union. Kentucky is the 37th ranked most extensive state in the country, covering roughly 40,400 square miles and is the 26th ranked state in terms of population with roughly 4.4 million people in the state. Kentucky has been nicknamed the “Bluegrass State” since bluegrass is found in many regions throughout the entire state due to the very fertile soil prevalent in these areas. This in turn led to high quality live stock breeding. The overall geography of the state is mixed and is made up of various environments and several abundant resources. Mammoth Cave National Park, the longest cave system in the entire world is located in Kentucky as well as the longest amount of navigable inland waterways. Kentucky is also home to the two biggest man made lakes on the east side of the Mississippi River. The state has a high population of wildlife, particularly turkey and deer along with the largest free ranging herd of elk east of the state of Montana. Other well known attributes to Kentucky include horse racing, college basketball, bourbon distilleries, automobile manufacturing, bluegrass music, and tobacco. Many of the state borders of Kentucky are based on the paths of rivers as they existed when the state was admitted to the union in 1792. In many of these areas the rivers have changed course away from where the original border used to be. The climate in Kentucky is considered to be humid subtropical, as the state experiences all four seasons and a variety of various weather patterns. Kentucky shares the state bird with a few other states as the Cardinal. The wild animal of the state is the gray squirrel while the state horse is recognized as the Thoroughbred. The state fish is the Kentucky Bass while the state flower is the Goldenrod and the state tree is the Tulip tree. Kentucky is also home to several big lakes such as Lake Cumberland, Kentucky Lake, and Lake Barkley. 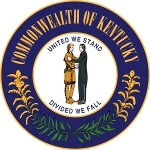 Kentucky played a major role in its early times in the formation of the United States and continues to play a major role with the wide variety of agriculture and industry within the state.